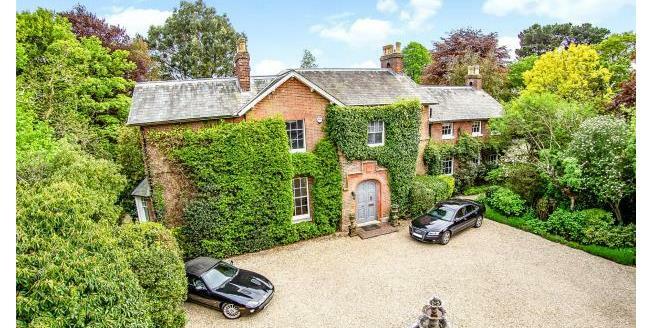 Abutting the open Common Land of Upper Pennington a spectacular former Victorian Vicarage. Reputedly dating back to circa 1840 and subsequently tastefully enlarged this exquisite Listed Grade II individual family home, has been refurbished and remodelled under the auspices of the current owners over a number of years, the whole being undertaken to an exemplary specification. The extensive accommodation is laid out over 2 floors served by twin stairwells, with the vast majority of the principle rooms having a unsurpassed southerly outlook over the mature park-like grounds having the backdrop of light woodland in the ownership of the property. Opening off a lobby with its associated cloakroom is an elegant reception hall serving a number of elegant reception rooms in the form of a double drawing room, a cosy sitting room, morning room and atmospheric study. To one side is a spectacular live-in kitchen/dining/family room and spectacular garden-side orangery, with various domestic offices. Overhead, a total of 6 bedrooms are served by 3 bathrooms (1 en suite) and an independent sizable shower room. 6 bedrooms, 3 bath/shower rooms (1 en suite), double drawing room, sitting room, morning room, kitchen/breakfast/family room, study, orangery, utility room, flower room, boiler room, cellerage, games room with loft store area, garden, extensive off-road parking. CLOAKROOM Fitted with suite comprising a high-level WC with traditional corner wash hand basin with base store cupboards under. Tiling to principal areas. DOUBLE DRAWING ROOM A particularly elegant reception room of grand proportions with ornamental coving and celling plaster work with contrasting wall panelling. Feature open fireplace incorporating a raised, projecting fire basket set on a polished marble hearth with matching slips with a carved ornate wooden surround with corresponding display niches to both sides. Oblong bay to the gardenside with small pane glazed door opening to paved seating terrace. 7 Wall light points. SITTING ROOM A cosy room of good proportions with an angled oblong bay to side overlooking the gardens. Feature flame effect gas set on a polished, projecting marbled hearth with corresponding tiled insets, painted carved wood surround and corresponding display niches to side. 4 Wall light points. MORNING ROOM Currently utilised as a secondary study/art room with bay to side. Feature traditional open fireplace with a mosaic style tiled projecting hearth and inset slips, the whole surmounted by a carved surround. STUDY Situated to the fore. An atmospheric room of good proportions with a feature fireplace incorporating a raised open basket set on a projecting slate hearth with a carved, blackened iron inset, the whole surmounted by a simple marbled surround. KITCHEN/BREAKFAST/FAMILY ROOM Natural Sandstone ceramic tiled floor throughout with recessed ceiling lights. KITCHEN Fitted with a bespoke range of cream colour washed store cabinets to both base and high level providing an excellent array of pull-out pan drawers and general storage, the whole being under-lit over the surrounding quartz flecked granite worksurfaces with contrasting tiled relief. Inset twin bowl ceramic sink with monobloc tap. Integral dishwasher. Pull-out bin drawers. Built-in base fridge with microwave housing over. Separate island unit comprising a range of pull-out pan drawers. Corresponding dresser unit comprising a back-lit glazed shelved display areas with central open display storage and a range of cupboards under. Substantial dark blue enamelled gas fired AGA with adjacent electric companion set, the whole set in a back-lit surround with carved wooden mantel over with contrasting tiled relief. Separate walk-in larder store cupboard. FLOWER ROOM Fitted with a range of general store cupboards for utility purposes. Various areas of open display shelving. Ceramic floor tiled floor. UTILITY ROOM Fitted with a range of store cupboards to both base and high level. Formica mottled worksurfaces with inset Villeroy & Boch enamelled sink with mixer tap. Space and plumbing for washing machine. Space for substantial freestanding fridge/freezer. CELLERAGE Stone steps descending to an area of cellarage with a further range of base store cupboards. Further door to an open traditional racked cellar. ORANGERY A more recent addition to the property constructed of quality painted hardwood casements, surmounted by a pitched roof with remote controlled blinds. Various three quarter glazed doors opening to the rear balustraded seating terrace and gardens beyond. Heated tiled floor. LANDING Access to a deep shelved airing cupboard with pre-lagged hot water cylinder. Secondary stairs descending to ground floor. Access to overhead roof void. EN SUITE BATHROOM Fitted with a bespoke suite comprising a high level WC and twin wash hand basins set in a carved, granite worksurface with a full width range of corresponding base store cupboards and drawers. Stand-alone ball and claw blackened bath with Edwardian style mixer shower. Walk-in wet room shower with drencher head. Traditional heated checkerboard style ceramic floor covering. Recessed ceiling lights. GUEST BEDROOM Fitted with a bespoke range of full-width, part shelved wardrobe store cupboards. Part glazed door to BALCONY with Wisteria clad wrought iron surround affording splendid vistas. INDEPENDANT BATHROOM Fitted with a low-level WC and pedestal wash hand basin. Stand-alone ball and claw bath with central Edwardian style mixer shower. Tile walls and floor. INDEPENDANT SHOWER ROOM With suite comprising a low-level WC and wall-mounted wash hand basin with a range of store cupboards under. Substantial walk-in drencher style wet room shower with glazed side screen. Granite effect ceramic tiling to all walls and floors. OUTSIDE The property is approached from the road via twin remote controlled substantial gates set on brick piers opening over a block paved splay terminating in a substantial gravelled courtyard featuring a central island bed with box hedging and a water feature. A backdrop of deep, ornamental herbaceous borders provide colour and interest throughout the seasons. Within the curtilage of the courtyard approach is a further purpose built former DOUBLE GARAGE complex with adjacent CARPORT set on a block paved base. To the rear, access is provided a useful workshop with double doors opening to a GAMES ROOM which has been derived from the former garage being a room of character fitted with a range of store cabinets. Wood panelling to dado height and recessed ceiling lights. Stairs ascend to a useful overhead pine clad LOFT STORE AREA with access to various areas of eaves storage suitable for a home office/gymnasium. To one side of the property is a small courtyard of associated outbuildings in the form of a BOILER STORE ROOM incorporating twin Worcester Bosch gas fired boilers and high pressure water cylinders. GARDEN CLOAKROOM Fitted with suite comprising a high-level WC together with a wall-mounted wash hand basin. The gardens associated with the property are laid essentially to a sweeping tract of well-maintained lawn interspersed with a diverse array of ornamental seasonal shrubs in the form of mature Rhododendrons, Azaleas and Camellias under panted with an array of spring bulbs, the whole having the backdrop of mature standing woodland (in the ownership of the property) that affords an unsurpassed level of privacy and seclusion with charming woodland walks through the natural glades. To the rear, brick edged gravelled pathways link the various areas of balustraded RAISED SEATING TERRACES accessed from both the drawing room and orangery being off-set by traditional Rose beds. SERVICES All main services are connected. The services and equipment remaining with the property have not been tested by John D Wood & Co. and we are unable to verify that they are in working order. DIRECTIONS From our office in the High Street continue out of the town along St Thomas Street and head towards Pennington. Pass over the roundabout adjacent to the Shell garage and continue to the parade of shops at Fox Pond. Turn right into South Street and continue through the village of Pennington until you join Ramley Road. The entrance to Culverlea House will be on the left hand side just past the entrance to Pinetops Close and Torreyana Pines.